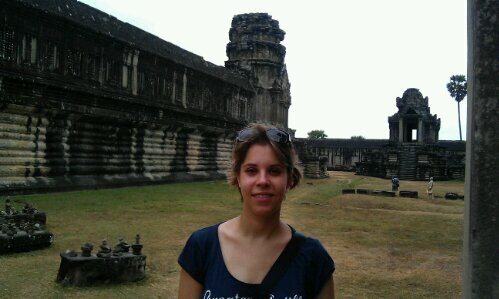 Yesterday we visited the ruins of Angkor. We decided to take a three day ticket, so that we could really see all we wanted to see and for the first day we hired a Tuktuk driver to drive us around the most famous sites. 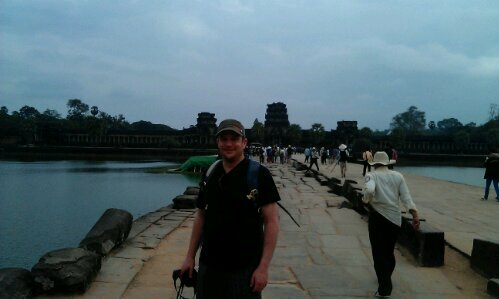 We saw Angkor Wat, Angkor Thom, Ta Prohm, the Jungle Temple and several more. With all these huge hotels that you can find all over Siem Reap, we already knew to expect loads of visitors. But nothing could prepare us for Angkor Wat, the most famous temples of all: Masses of visitors, many of them in groups, are dropped off infront of Angkor Wat by their bus oder Tuktuk driver and then pour into the temple area. It’s a huge area with several different enclosure levels and most beautiful reliefs showing traditional Hindu stories, especially the Apsara dancers, heavenly creations, in many different dancing positions. 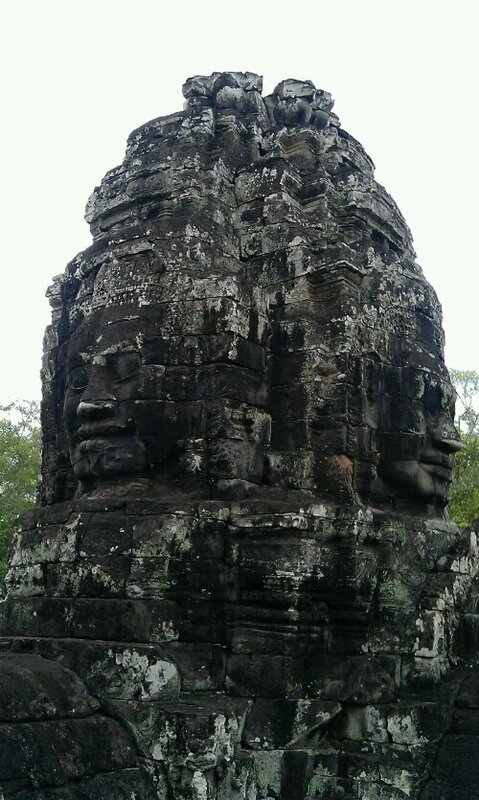 Then we visited the Bayon, the temple with the many faces in the nearby Angkorian town of Angkor Tom, the weather unfortunately was still very cloudy. Views were still nice but we try to come back to take some more pictures. 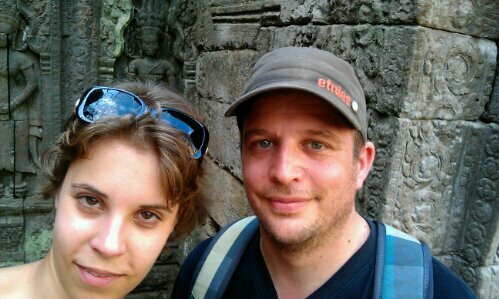 Later we moved on to see some more temples and ruins in the 3 x 3 km big area of Angkor Tom. The sun started to come up now but that also meant it got even hotter. By that time I was a bit disappointed. I had imagined the ruins to be more breathtaking. Of course they are huge and beautifully carved, but they were just ruins after all and I couldn’t see people ever living there. But that was maybe also because most remains were temples, no palasts or other living quarters. So when we ventured on after lunch I expected more and more temples and this was what we got. But then we went to the so-called jungle temple, Ta Prohm, a monastery that was overgrown with trees and left that way. Here it was still very crowded but amazing. Huge trees are growing all over the place. They just incorporated the buildings in their growth structure where possible and crashed them where not. We decided that after our first visit on Tuesday, we had to come back again. But after walking 1km long through this monastery we started to be quite tired. But our visits were not over yet. Our Tuktuk driver drove us to two more temple areas before we went home. Arriving back at our room all we wanted was a nice shower. But we came back only to realise that the warm water wasn’t working. But funny enough I start to get used to having cold showers. It’s so hot anyway that it doesn’t matter. What does matter though is that we pay $15 for a room with hot water which hasn’t got hot water. But as we haven’t paid yet we still need to discuss that with the guest house owner as we have already reported the problem, it was supposed to be fixed but wasn’t. But we got fresh and clean anyway and finished Tuesday with some great dinner at a BBQ place that had something that I had come across so far as Mongolian BBQ, but they claim it’s Cambodian: a bowl full of hot coal is placed on a table, topped by an inlay with some water. 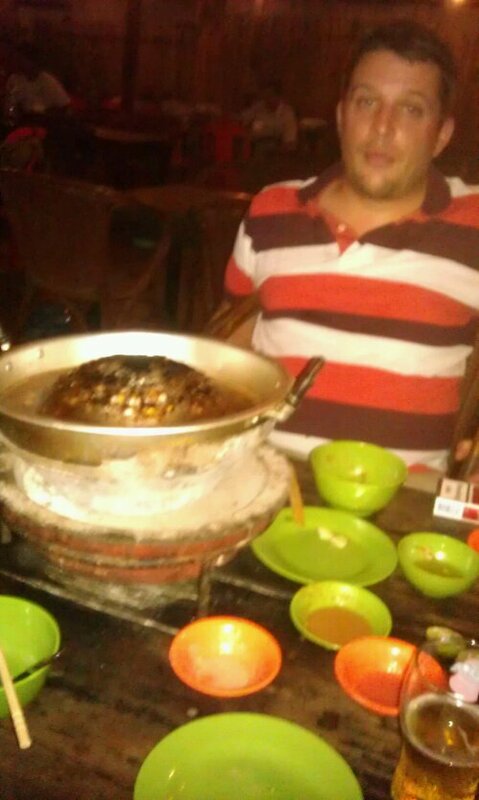 Now you go to the buffet and get all kinds of meat, unindentifiable other things and vegetables and you either cook them in the water, turning it slowly into a nice broth or you barbeque it on the upper part. It was very delicious even though I don’t want to know exactly what it all was that I ate. And now today we are going to explore Angkor again some more with bikes we rented. 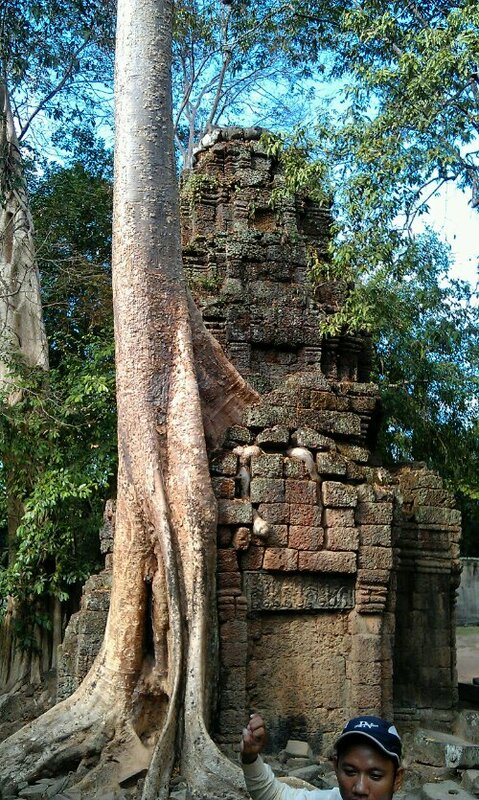 This entry was posted in Cambodia and tagged Angkor, History, Ruins, Siem Reap, Temple by kathatravelling. Bookmark the permalink.